I have created a new plugin for Milight which is the result of my ongoing efforts to provide better support for Milight with pimatic. Milight color action to control color of MilightRGBWZone, MilightBridgeLight, and MilightFullColorZone. @merphun Yes, I’ll add this soon. @merphun Can you pls let me know what kind of error you get? Thanks! i´ve bought a milight bridge with 4 milight RGBW bulbs. i can control the bulbs with the Mi-Light Remote app for android. i can see the color control and the brightness, but the color is not changing. Did you check the pimatic log for error messages? Do you have a firewall, e.g. iptables, installed on your Raspi which might be blocking udp outbound traffic? no error messages, firewall or other i dont know. its stock raspbian. ip address of the bridge is changed to static. changed zone 1 to 0 in config. zone 0 is working very well. great! but in the milight app the bulb is on zone 1. But your milight bright is in the same network as pimatic is and the milight is not an acces point? yes, milight bridge and pimatic are in the same network. milight bridge is in STA Mode. i´ve added the config for MilightWWCWZone, too. ON/OFF is not working in this version? Note, MilightWWCWZone will only work with WW/CW bulbs. These bulbs have different control codes than the RGBW bulbs. Do you see packets receiving? 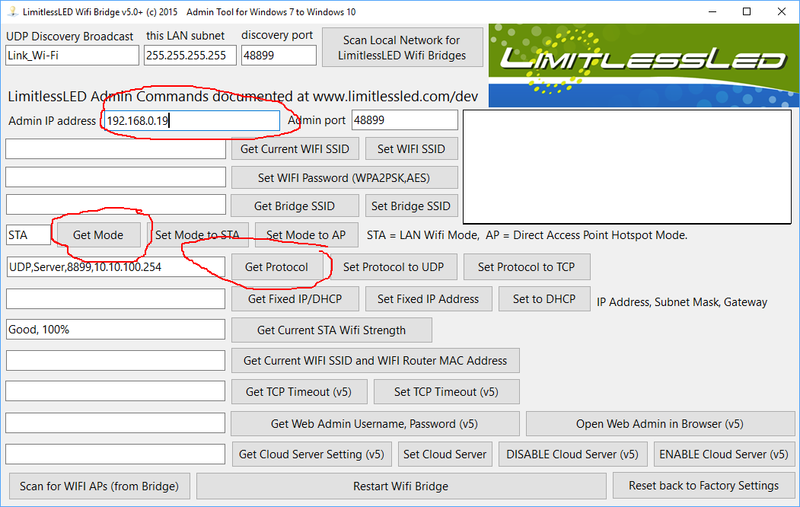 If, yes and you have a Windows PC, please download http://www.limitlessled.com/download/LimitlessLEDv5.zip and run the exe. Then enter your IP address in the filed marked red and press “Get Protocol”, please send the result shown to the left of the button. the tool shows me the same as you in the protocol field. i think i solved it. the bulb is on zone 3 and not on zone 1 as i thought. its a little weird. in the app the bulb was on zone 1. whatever, it seems that its okay now. great plugin! thanks so much! do you know when you release an update with more functions? Sorry, I completely overlooked you said it is working on zone 0. It strange however, that the zone is not the same as assigned by the app. I am using Milight 1.9 (release 22.12.2015) on iOS which works fine for me (same zone id as with pimatic). Thanks. I’m glad you like it! Please consider ★ starring the project on github. I am planning to add a color action soon. It’s almost finished. Maybe I can finish this off next weekend. How is it possible to get an On/Off Button for the RGBW zone too? In addition to the color and brightness slider? Not at the moment, I am afraid. I omitted the switch by design to make the UI as minimalistic as possible. However, you can use switch predicates and actions as part of rules. If I find some time to do it I’ll add the UI switch as an option. So, I’ll regard this as a feature request. Unfortunately the floating of the elements isn’t very good on smartphones. Sliders are very small too, so buttons are better to use on a smartphone. A cool feature would be a custom placement and size of elements, but this is pimatic and not plugin related. I’m replacing some of my Milight RGB lamps with WWCW bulbs (better warmwhite color for use in the living room). Unfortunately, the pimatic-led-light plugin does not support WWCW bulbs (as far as I know), so I’m very happy that pimatic-milight-reloaded indeed supports them. It’s working great! One thing I can’t figure out is how to dim the WWCW bulb using rules. I’m using a “movie mode” rule dimming all bulbs to 20%, which is working great with the RGB ones, but it doesn’t seem to work with the WWCW ones. Is it even possible since the control scheme is different (arrows instead of a slider, see “Wohnzimmerlampe” in the picture)? Any advice is greatly appreciated.